"THE CAPTURE OF BENEDICT ARNOLD"
12/12/2016 (10:01PM - 11:00PM) (Monday) : THE TEAM LEARNS THERE ARE TWO SIDES TO EVERY STORY WHEN THEY ENCOUNTER AMERICA'S FIRST TRAITOR. 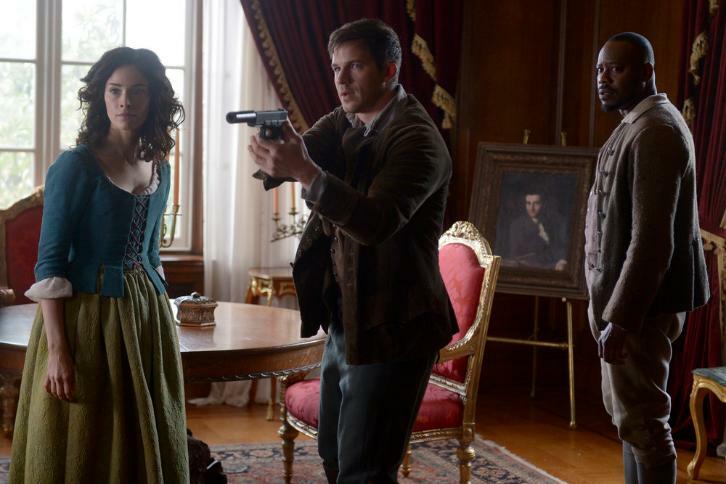 A stunning turn during the American Revolution prompts Lucy (Abigail Spencer), Wyatt (Matt Lanter), and Rufus (Malcolm Barrett) to question whether they've been fighting on the wrong side this whole time. While Agent Christopher (Sakina Jaffrey) prepares for the worst back in present day, the team encounters the Father of the Country (Damian O'Hare), makes a dubious pact, and confronts the possibility they may not be a trio for long. Also starring Goran Višnjic, Paterson Joseph and Claudia Doumit. Guest starring Curtis Caravaggio, Armin Shimerman, Jake Brennan, and Robinne Lee.